Saints Peter & Paul Cemetery, located at 264 South Union Road, and St. Michael’s Cemetery, located at 372 South Cayuga Road, are the final resting places for many of our parishioners. Our cemeteries have been a part of Saints Peter & Paul Parish since shortly after the founding of our parish. 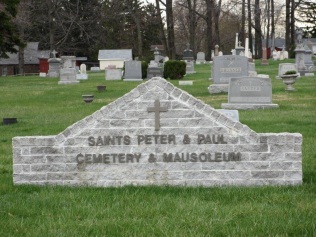 Saints Peter & Paul Cemetery offers both in-ground burial sites as well as crypts in the mausoleum. St. Michael’s Cemetery offers in-ground sites and niches in the columbarium. For more information on the cemeteries, contact Lynn Baker in the Pastoral Office at 632-2559 x206 or email lynn.baker@roadrunner.